While top 10 lists went out of style on YouTube and other sites ages ago, the cultural staple of the numbered list in general doesn’t seem to have gone away. While some have bemoaned the situation, it also seems to be becoming the most popular means of blogging! 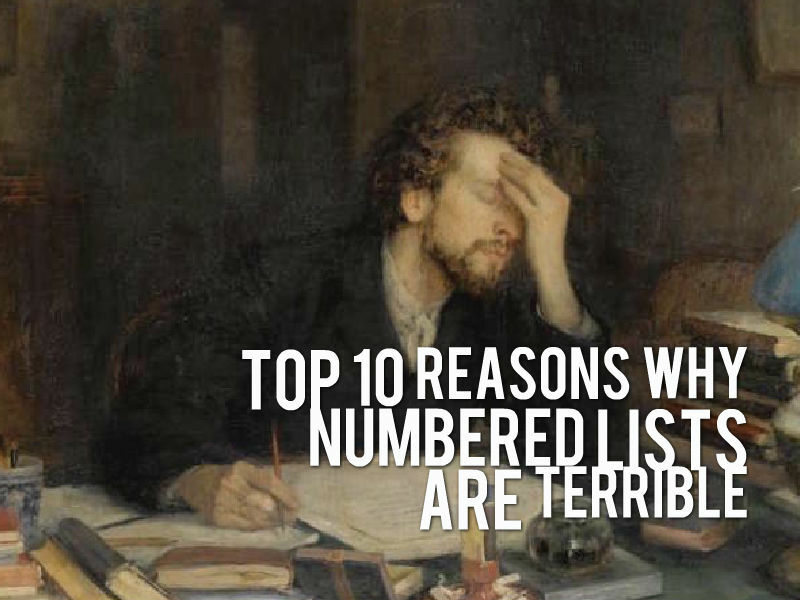 Here’s why numbered lists are awful on so many levels. 1. They’re shameless, shameless clickbait. Is there something inherently wrong with numbered lists? No. Are they used almost exclusively to get more clicks because writers, bloggers, and content marketers know that it’ll work, like selling jam and toast to a peanut butter manufacturer? Certainly. Are they used too frequently as a cop-out for coming up with a new format or engaging idea? Lord, yes. 2. No one actually reads them; they just skim headings. 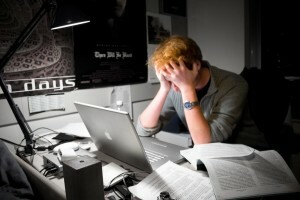 If someone sees a block of text, it’s very, very unlikely that visitors will actually read it. Using headings in general will work much better, and using headings with numbers, for whatever reason, makes non-readers’ brains do a little happy dance of consuming enough to believe that they understand your piece and feel really smart for “reading” something. 3. You’re doing it right now. You hypocrite. You may nod approvingly at my headings, but your lack of attention span is doing you in. I know. It’s hard. It’s quite surprisingly hard to focus and read the little, less-bold text under the bold text. Seconds drag by, and you just want to hop pleasantly to the next thing. 4. Items on the list should often be consolidated (like the previous two items). Repetitive ideas and useless information are very common in numbered lists. Also, have you ever noticed when the heading itself is sufficient enough information, and more detail is not necessary, but because of the format, something needed to go underneath? This adds to the repetitiveness, which adds to the fact that you’re likely not going to read the information under the headings. Also, have you ever actually read a numbered list and realized abruptly that the sub-information should have its own, separate heading because it’s its own, different idea? It’s infuriating. 5. The actually number of things is usually completely arbitrary. Unless someone is doing this with some set number in mind, joking around on some sort of meta-level, or at the behest of a client, one simply creates a list of N number of things after coming up with ideas until they run out at N. In other words, you don’t need to comprehensively research something, just find a couple of nuggets to stuff into a format. If you can’t come up with an arbitrary number, you’re usually safe with five, seven, or ten (the favorites for numbered lists). 6. Usually, this information is really terse and obvious, and if you spent more than five minutes thinking about it, you’d likely come up with more items to list. 7. They just spoon-feed information. Part of the reason that they work is that they can be consumed and understood very, very quickly. This is not just about lazy writing; it’s about a lazy readership, too. Studies have reportedly show that we now have the attention span of a goldfish. So it makes sense that we’d have media that only gives you the most important formation in the fastest-to-read format. Who has time to read? There are things online (so many, many things)! Some of you may have even given up on this list, either because I’ve somehow wounded your pride (forgive me, for alas, hypocrites give the best criticisms) or because you already really, really don’t have the energy to consume any more. But life isn’t as simple as a palatable, easy-to-digest numbered list. Sometimes, topics warrant a full sit-down, place-your-elbows-on-your-desk reading. Sometimes, comprehensively covering a topic isn’t possible in a numbered-list format. How does one plan to learn about the physics of gravitational waves? In a numbered list?! Wait … wait, no! 8. They game the system. The numbered list games and cheapens the system just as the “let’s play” format games and cheapens YouTube. The production group that spends thousands of dollars making one fake trailer on YouTube will make far less in ad revenue than one person recording themselves playing a video game for several hours. The lazy content that’s cost-efficient and gets a lot of clicks wins. You spent less on it and got more. The numbered list is the writing equivalent of a “let’s play.” It can be churned out quickly and mass-produced, works well, doesn’t cost much, and rakes in the dough. That’s why so many numbered lists are now becoming slide shows: Ad revenue can be gathered for each page you scroll through. But I love “let’s play” videos, and I personally enjoy numbered lists. What’s the problem? Several well-known YouTube content creators have been complaining about this lately. Their creativity has been dampened because of the repetitive nature of the business. This “change in soul” has negatively impacted many video creators. I think that the numbered list has negatively affected bloggers and online writers as well. Some writers have complained, but writers, who tend to be paid far less for their work, paradoxically tend to complain less as well. It’s largely unsaid but largely known. 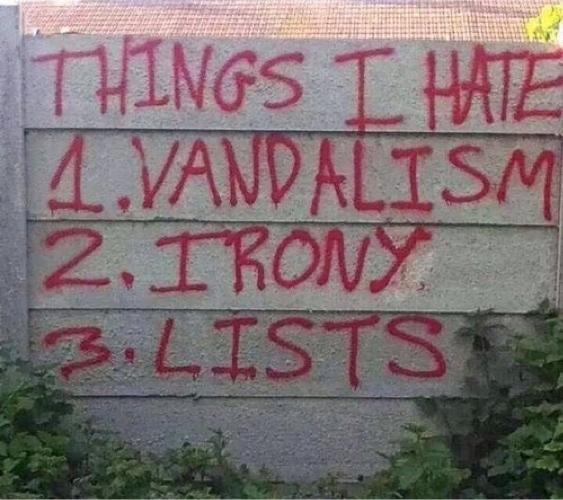 Think about it: Even if the writing in a numbered list is really, truly terrible, it’s kind of too late. These lists grab your attention for a second and keep you scrolling just long enough for Google to think that they’re good articles. They’re not affecting your bounce rate; they’re not negatively impacting the site. Every time you click on one of these headlines, someone is rewarded, including underpaid (or simply unpaid) writers. My point is that the list-blog format not only promotes but actually rewards lazy, sloppy writing. 9. They’re the Big Mac of blogs. Because they’re cheaply made, they’re bad for you to consume, too. Some writers produce great stuff with numbered lists, but you can also find plenty of people in this appealing format abusing its power by stuffing in inaccurate facts or terse, useless information for a quick buck. This dissemination of bad information is bad for the Internet as a whole. It’s enough to make you believe that the Statue of Liberty was a Christmas present or that Bill Cosby is dead. An inexperienced writer will produced something rife with inaccuracies, and because the article may be coming from a reasonable-sounding source, the innocent reader believes them. 10. When you’ve finished, you’ve likely learned very little. We certainly don’t have to give them up. I have written using a list format, and I plan to keep doing it. 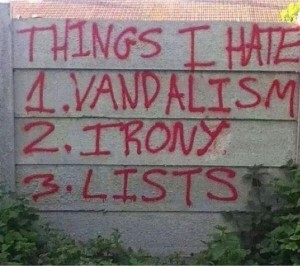 I also will occasionally click on lists to read them. But this is an important shift in tone to be aware of. Leave a comment, let us know what you think, and try to resist the urge to click numbered lists that are created just for the sake of numbered lists.